Hello and welcome to ESPN's live coverage of the first day of the third and final Barcelona test. 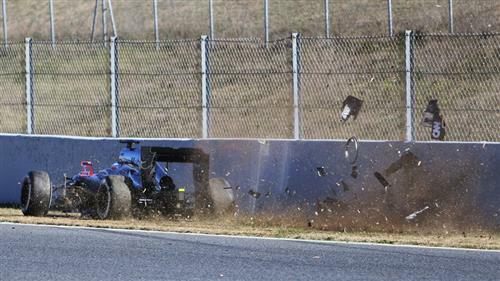 Obviously the biggest news coming into this test is that Fernando Alonso will not participate in the final test for McLaren, following his unusual but nasty crash last Sunday which left him with concussion. Can Mclaren turn things around in this final round of winter testing?? Is McLaren running in full power today? The temperature is just over 5 degrees this morning. Chilly, but not as cold as some of the mornings last week. I didn't have to de-ice my car when I left the hotel, which was a bonus. The session is green and Ericsson and Raikkonen bolt straight out of the garage and onto the track. @Nate. So with Fernando out... will Jenson run all four days or will a test driver have a run too? @Marais: Kevin Magnussen will take over both of Alonso's days, though McLaren is yet to confirm its schedule beyond today. Enlighten us with the Alonso crash last week... Is it only because of a gust of wind?? Can it be?? @SnehasisDas: Well, opinion in the paddock is split. It was a very unusual crash, indeed. We have no reason to doubt McLaren's official press release but the way they handled the aftermath was rather clumsy, especially here at the circuit last Sunday. Wind could certainly cause a crash, as it did with Sainz later in the day, but crucially he spun off the other way - the more logical way - at that turn. Hamilton, fresh from an appearance at the BRIT Awards last night, is out there on his installation lap. Force India are testing 2015 car today ? @MadhusudanRamakrishna: Nope, they unveil the car tomorrow. @altaf: Kimi. Today's driver line-up is written in full at the top of this thread. @SnehasisDas: It's far too early to say. I don't think it's a bad thing to be at McLaren-Honda, it seems a quite exciting partnership. But in Arrivabene Ferrari finally seems to be moving in the direction Alonso always wanted, with all departments working towards the same goal. There was news around Mercedes using all their tokens before first race, throw some light on it Nate. @MadhusudanRamakrishna: Yes, the team plans to use them all before homologation. The benefit of that being any engine you start the season with and use before you next use a token will not recieve the same upgrade, meaning if you need to switch back to an old engine at any point in the season you'll be at a disadvantage. So what do you think could have possibly happened to Alsonso's car in that crash? What's the betting line on SFI actually introducing a 2015 car tomorrow. Or is it the Car of Tomorrow? @GoldenOldie: Yes, we were just talking about that now in the press room. It's a head-scratcher. But then, this is testing, and the teams can run the cars how they like really. I'm sure there will be clarification sought from the FIA before the season begins properly. That Lotus looks TIGHT, they are my sleeper pick for a win. Ericsson gets his first lap time on the board, albeit 16 seconds down on Hamilton's headline time. Nate: A huge doubt.... With all these regulations, even the size and bore of the shaft are fixed, size of the power harvested is fixed,, what are the avenues except the aerodynamics the teams could gain advantage year-over-year?? @rockedin123: Well F1 has become much more of an engine formula under the new rules, hence the dissatisfaction of guys like Newey. So engine gains now are just as important as aero was in the V8 era. There's an update for you on Force India's plans. We'll see them back in action tomorrow. As I've stressed, we don't know fuel loads at this stage - but that is an incredibly impressive medium tyre time from Mercedes. Very ominous. Since the cameras are on all cars, I can't see why not let teams use them for aero aid. I think it's a bit over-regulated. Still nothing much to report. Sainz and Kvyat the men out on track. We haven't seen any of the big four out on track for a while now. @Sitank: The factory teams - Mercedes, Red Bull [Renault], Ferrari and McLaren [Honda]. Nate, Seemingly Mercedes are away to spend big with the tokens on the engine for the start of the season, which is a big surprise cause they weren't seemingly going to decide till after the first race, Mercedes must be worried about Renault catching them. @nate what is your take on mercedes spending majority of tokens ...? next question is hypothetically let us believe that ferrari has caught up with mercedes my question is that means ferrari has used up all of his tokens.. or else it is possible to find pace without the tokens ?